The worlds of metal and ivory-tinkling combine in an incredible pairing for this year's Grammy Awards - here are Lang Lang and Metallica in rehearsal for their performance. 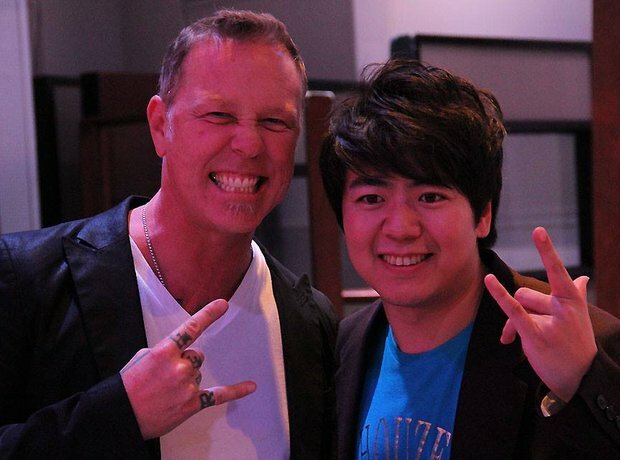 Lang Lang and Metallica singer James Hetfield show their horns ahead of Sunday night's performance. The whole band consult with the Chinese pianist. Guitarist Kirk Hammett is privy to what's known in the industry as the 'Classic Lang Lang' pose. James Hetfield bares his teeth in rehearsal. Bassist Rob Trujillo, Lang Lang, James Hetfield and a small psychedelic horse. Look at that left hand go! Chatting about the Grammy Awards performance in rehearsal. Bassist Rob Trujillo has a gift for Lang Lang, it would seem. Arm aloft, Lang Lang rehearses with Metallica. Lang Lang chats to Metallica drummer Lars Ulrich at a rehearsal. James Hetfield at the mic while the rest of the band (including Lang Lang) back him up. Looking over the sheet music for Sunday night's Grammy Awards show. Metallica's legendary duelling guitarists James Hetfield and Kirk Hammett, and Lang Lang. According to this brief setlist and handy lyric reminders for James Hetfield, they'll be performing Metallica's 'One'. The whole band consult with Lang Lang ahead of Sunday's Grammy Awards performance of Metallica's 'One'.